Red blood cells are one of the most important parts of the body as they carry oxygen between your lungs and the various cells in your body. This is why people with a low red blood cell count will feel it significantly and even show it. They may be weak, tired, and pale or have issues catching their breath. This information should help you better understand what is going on and what you can do. What Is the Normal Red Blood Cell Count Range? The most common cell type in your blood is the red blood cell. There are millions and millions of red blood cells, which are disc-shaped. The bone marrow of healthy adults will continuously produce them. Red blood cells contain hemoglobin, a substance responsible for bringing carbon dioxide and oxygen throughout your body. The red blood cell count, or RBC count, lets you know if you have a low amount of red blood cells, which is known as anemia, or a high amount, which is known as polycythemia. 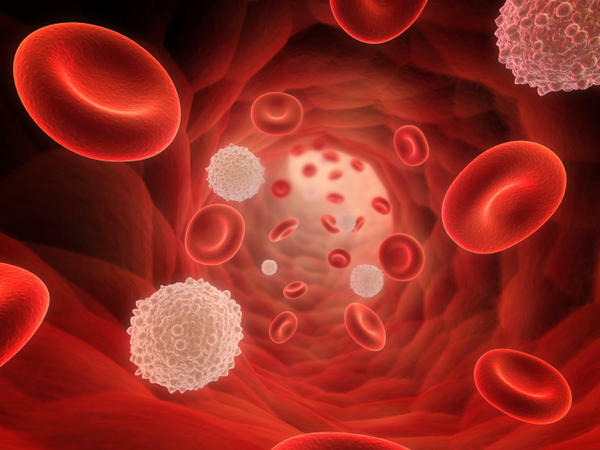 There are many possible causes of low red blood cell count, such as chronic blood loss leading to iron deficiency anemia, acute blood loss, or hereditary disorders. High RBC levels, on the other hand, are fairly uncommon. The optimal range for an average person will be between 3.95 and 5.35 M/mm3, but it varies by person, gender, and age. These figures from webmd show specific ranges for given groups. Fatigue or tiredness is the most common of all symptoms associated with having a low red blood cell count. This is due to the lack of hemoglobin within the blood since this iron-rich protein is found in your red blood cells and carries oxygen throughout the body. Other symptoms of a low red blood cell count may include dizziness (particularly when standing), shortness of breath, headaches, pale skin, chest pain, and coldness in the hands or feet. When there aren’t enough red blood cells in your body to carry hemoglobin, your heart has to work even harder so the lower amount of oxygen in your blood can be moved. This may lead to heart failure in severe cases or less serious issues such as an enlarged heart, a heart murmur, or irregular heartbeats (arrhythmias). When you have a low red blood cell count, your blood has a reduced capacity to carry oxygen and its viscosity is also reduced. Your blood is therefore “thinner” and can move more quickly because of the lack of resistance among the body’s blood vessels. This in turn causes more blood to flow through your heart in a single minute than typically does, known as increased cardiac output. The blood also carries less oxygen so your blood vessels dilate, further reducing resistance and increasing the speed of blood flow. During exercise or other times of increased demand, your body can’t cope because of your low red blood cell count. Your heart will try to beat faster and will increase your breathing rate so your tissues get enough oxygen. This is frequently not enough, leading to tissue injury or even acute heart failure. Bleeding is a common cause of red blood cell loss. It may happen quickly, such as from surgery, frequent blood draws, or an injury. It may also occur slowly and chronically, such as from heavy menstruation or a lesion in your intestinal system leading to bleeding. Bone marrow produces red blood cells which then circulate for around 120 days in the bloodstream with damaged or old cells being removed by your spleen. Various diseases may cause excess damage to blood cells or make the spleen remove them too early. Some possibilities include autoimmune hemolytic anemia and sickle cell anemia. There are also diseases, drugs, and infections which can interfere or damage the bone marrow cells responsible for producing mature red blood cells. Some examples include chemotherapy, myelodysplasia, or scarring of the bone marrow. The treatment for a low red blood cell count will depend on the causes and symptoms. If anemia is the cause and you have cancer, you may need a red blood cell transfusion. If it is due to anemia, you may receive drugs that stimulate the production of erythropoietin or supplement it. These can be given as injections and take several weeks to start working. Anemia from malnutrition may require oral or IV supplements. You may also be directed to eat foods with folic acid or iron. You can also do some simple things on your own to improve your red blood cell count. Eat More Iron-Rich Foods: These foods include dried raisins, red meat, egg yolks, beans, organ meats like liver, dried prunes, green leafy vegetables like spinach and kale, lentils, and legumes. Iron is essential to red blood cells and hemoglobin. Add Copper: Get copper from whole grains, nuts, cherries, beans, chocolate, liver, shellfish, and poultry meets. This mineral helps your cells access the necessary iron for iron metabolism. Eat Enough Folic Acid: Folic acid can improve RBC production. Try eating dark green leafy vegetables, cereals, bread, lentils, peas, nuts, and beans. Consume More Vitamin A: Vitamin A helps your red blood cells get enough iron while developing to process hemoglobin. Get it from grapefruit, cantaloupe, plum, watermelon, apricots, sweet red peppers, squash, carrots, dark green leafy vegetables, and sweet potatoes. Exercise Daily: Doing vigorous exercise makes you tired and sweat. It also requires your body to increase oxygen production which then tells your brain it lacks oxygen so more hemoglobin and red blood cells are produced. Drop Bad Habits: Stop smoking and drinking alcohol. Smoking constricts blood vessels, affecting oxygen circulation and alcohol thickens and slows the blood. Have a Blood Transfusion: In some cases, a blood transfusion may be necessary. Your doctor will let you know. Get Regular Physical Assessments: This will let you keep track of your RBC and any progress you make.